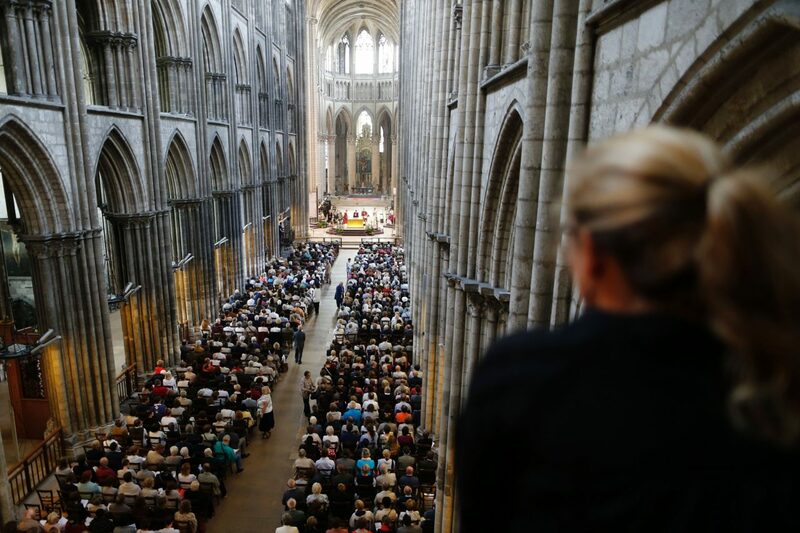 Despite France’s huge Muslim population of around five million, just a few hundred turned up in churches around France to show “solidarity” during mass following the brutal jihadist murder of a priest in Nice. And despite Nice’s top imam, Otman Aissaoui (often mis-written as Otaman Aissaoui), leading a delegation to a Catholic mass, the country-wide response from France’s Muslims can only be described as underwhelming. “Being united is a response to the act of horror and barbarism,” said Mr. Aissaoui, an imam who has genuinely spoken out against extremism in recent years. His mosque came under intense pressure from local nationalist group Nissa Rebela in 2011. The group is now ostensibly loosely affiliated to the Front National. The Notre Dame church in southwestern Bordeaux is also reported to have “welcomed a Muslim delegation, led by the city’s top imam” Tareq Oubrou – a one-time Muslim Brotherhood radical who over the past decade come around to advocating a “liberal” and Western version of Islam which is of “low visibility”. For instance, Oubrou no longer opposes the ban on the veil and indeed says there is no justification for the face veil in the Quran. For his change of heart over the years, he has become a major target for Islamic State which has urged him to be “killed without hesitation”. The events took place all around the country, and indeed one in Rome too. But one might have expected a higher turnout than has been reported by news wire agencies. Even if the total across the country has been underestimated and was as high as 5,000, or even 10,000, at a maximum this would only represent 0.2 per cent of the French Muslim population. Fifteen per cent of French citizens are believed to attend church regularly. But despite the life-risking efforts of some Muslims in the country, the vast majority appear to be unwilling to stand alongside them, as evidenced by Sunday’s events. And while moderate Muslims speaking out in France needs to be encouraged and applauded, it is perhaps a sign of how far the country has gone with its appeasement to a multicultural policy that more Muslims around the country did not turn out to stand in solidarity with their Christian countrymen. “It’s an occasion to show (Muslims) that we do not confuse Islam with Islamism, Muslim with jihadist,” said Reverend Jean Rouet in Bordeaux. 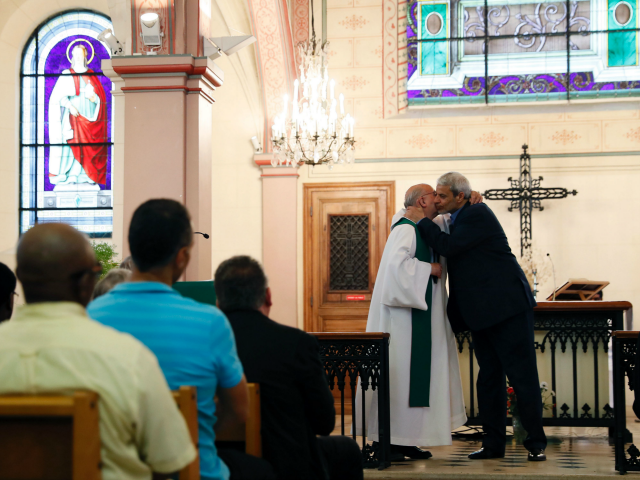 The most poignant moment of Sunday’s mass, AFP reports, was when the faithful turned to greet each other in the pews, either shaking hands or kissing. And outside the Rouen cathedral, a few policemen and soldiers stood guard but did not conduct searches, seeking to reassure a jittery population after the second jihadist attack in less than a fortnight. The events came as Prime Minister Manuel Valls called for a new “pact” with the Muslim community in France, Europe’s largest with around five million members. Mr. Valls, instead of aiming his ire at Muslim extremists, took aim at the “far right”. He said: “Islam has found its place in France… contrary to the repeated attacks of populists on the right and far-right”. He condemned “this intolerable rejection of Islam and Muslims”.